Oxygen is the chemical element with the symbol O and atomic number 8. It is part of the chalcogen group on the periodic table. It is a very reactive nonmetal. It also makes oxides with many elements. It is the third-most common element in the universe, after hydrogen and helium. When alone, two oxygen atoms usually bind to make dioxygen (O2), a colourless gas. It has no taste or smell. It is a pale blue as a liquid and solid. Dioxygen gas makes up 20.8% of the Earth's atmosphere. Oxides make up nearly half of the Earth's crust. Dioxygen is used in respiration in most life on Earth. Many organic molecules in living things have oxygen in them, such as proteins, nucleic acids, carbohydrates and fats. Oxygen is a part of water, which all known life needs to live. Plants make the Earth's dioxygen by photosynthesis, using the Sun's light to separate oxygen from water and carbon dioxide. Ozone (O3) is at the top of the Earth's atmosphere in the ozone layer and protects life on Earth from dangerous ultraviolet radiation. Oxygen was isolated by Michael Sendivogius before 1604. It is often thought that the element was discovered by either Carl Wilhelm Scheele, in Sweden, in 1773, or Joseph Priestley, in England, in 1774. Priestly is usually thought to be the main discoverer because his work was published first, even though he called it "dephlogisticated air", and did not think it was a chemical element. Antoine Lavoisier came up with the name oxygen in 1777 and was the first person to say it was a chemical element. He was also right about how it helps combustion work. Oxygen is used for making steel, plastics, textiles, rocket propellant and for welding. One of the first known experiments on how combustion needs air was carried out by Greek Philo of Byzantium in the 2nd centure BCE. He wrote in his work Pneumatica that turning a vessel upside down over a burning candle and putting water around this vessel meant that some water went into the vessel. Philo thought this was because the air was turned into the classical element fire. This was wrong. A long time after, Leonardo da Vinci correctly worked out that air was used up when combustion happened, which forced water into the vessel.. In the late 17th century, Robery Boyle found that air is needed for combustion. English chemist John Mayow added to this by showing that fire only needed a part of air. He called this spiritus nitroaereus, which we now call dioxygen. In one of his experiments, he found that putting a candle in a closed container made the water rise to replace one-fourteenth of the air's volume in the container, before going out. The same thing happened when a mouse was put into the box. From this, he worked out that "nitroaereus" is used for respiration and combustion. Robert Hooke, Ole Borch, Mikhail Lomonosov and Pierre Bayen all made oxygen in experiments in the 17th and 18th centuries. None of them thought it was a chemical element. This was probably because of the idea of the phlogiston theory. This was what most people believed caused combustion and corrosion. J. J. Becher came up with it in the year 1667, and Georg Ernst Stahl added to it in 1731.The phlogiston theory stated that all combustible materials were made of two parts. One part, called phlogiston, was given off when the substance containing it was burned, while the dephlogisticated part was thought to be its true form, or calx. Very combustible materials that leave only a small amount of residue, like wood or coal, were thought to be made of phlogiston. Things that corrode, like iron, were thought to contain only a small amount. Air was not part of this theory. Polish alchemist, philosopher and physician Michael Sendivogius spoke about a substance in air, calling it the "food of life"., and this substance is the same as oxygen. Sendivogius found, between the years 1598 and 1604, that the substance is the same as what is made during the thermal decomposition of potassium nitrate. Some people believe this was the discovery of oxygen while others disagree. It is often also said that oxygen was first discovered by Swedish pharmacist Carl Wilhelm Scheele. He made oxygen by heating mercuric oxide and some nitrates in 1771. Scheele called the gas he made "fire air", because it was the only gas known to allow combustion. He published his discovery in 1777. On 1 August 1774, an experiment carried out by British clergyman Joseph Priestley focused sunlight on mercuric oxide in a glass tube. This made a gas he called "dephlogisticated air". He also found that candles burned brighter in the gas and mouses lived longer while breathing it. When he breathed the gas, he said (simplified) "It felt like normal air, but my lungs felt lighter and easy afterwards." His findings were published in 1775. Because his findings were published first, he is usually said to be the discoverer of oxygen. French chemist Antoine Lavoisier later said he had discovered the substance as well. Priestly visited him in 1774 and told him about his experiment. Scheele also sent a letter to Lavoisier in that year that spoke of his discovery. Lavoisier carried out the first main experiments on oxidation and gave the first right explanation on how combustion works. He used these and other experiments to prove the phlogiston theory wrong. He also tried to prove that the substance discovered by Priestley and Scheele was a chemical element. In one experiment, Lavoisier found that there was no increase in mass when tin and air were heated in a closed container. He also found that air rushed in when the container was opened. After this, he found that the tin had increased in mass by the same amount as the air that rushed in. He published his findings in 1777. He wrote that air was made up of to gases. One he called "vital air" (oxygen), which is needed for combustion and respiration. The other he called "azote" (nitrogen), which means "lifeless" in Greek language. This is still the name of nitrogen in some languages, including French. Lavoisier renamed "vital air" to "oxygène", meaning "producer from acids" in Greek. He called it this because he thought oxygen was in all acids, which was wrong. Many chemists realised that Lavoiser was wrong in his naming, but the name was too common by then to change. "Oxygen" became the name in the English language, even though English scientists were against it. John Dalton's theory of atoms said that all elements had one atom and atoms in compounds were usually alone. For example, he wrongly thought that water (H2O) had the formula of just HO. In 1805, Joseph Louis Gay-Lussac and Alexander von Humboldt showed that water is made up of two hydrogen atoms and one oxygen atom. By 1811, Amedeo Avogadro correctly worked out what water was made of based on Avogadro's law. By the late 19th century, scientists found that air could be turned into a liquid and the compounds in it could be isolated by compressing and cooling it. Swiss chemist and physicist Raoul Pictet discovered liquid oxygen by evaporating sulfur dioxide to turn carbon dioxide into a liquid. This was then also evaporated to cool oxygen gas in order to turn it into a liquid. He sent a telegram to the French Academy of Sciences on 22 December 1877 telling them of his discovery. As dioxygen, two oxygen atoms are chemically bound to each other. This bond can be called many things, but simply called a covalent double bond. Dioxygen is very reactive and can react with many other elements. Oxides are made when metal elements react with dioxygen, such as iron oxide, which is known as rust. There are a lot of oxide compounds on Earth. The common allotrope (type) of oxygen on Earth is called dioxygen (O2). This is the second biggest part of the Earth's atmosphere, after dinitrogen (N2). O2 has a bond length of 121 pm and a bond energy of 498 kJ/mol Because of its energy, O2 is used by complex life like animals. Ozone (O3) is very reactive and damages the lungs when breathed in. Ozone is made in the upper atmosphere when O2 combines with pure oxygen made when O2 is split by ultraviolet radiation. Ozone absorbs a lot of radiation in the UV part of the electromagnetic spectrum and so the ozone layer in the upper atmosphere protects Earth from radiation. Tetraoxygen (O4) was discovered in 2001. It only exists in extreme conditions when a lot of pressure is put onto O2. Oxygen dissolves more easily from air into water than nitrogen does. When there is the same amount of air and water, there is one molecule of O2 for every 2 molecules of N2 (a ratio of 1:2). This is different to air, where there is a 1:4 ratio of oxygen to nitrogen. It is also easier for O2 to dissolve in freshwater than in seawater. Oxygen condenses at 90.20 K (-182.95°C, -297.31 °F) and freezes at 54.36 K (-218.79 °C, -361.82°F). Both liquid and solid O2 are see-through with a light-blue colour. Oxygen is very reactive and must be kept away from anything that can burn. There are three stable isotopes of oxygen in nature. They are 16O, 17O, and 18O. About 99.7% of oxygen is the 16O isotope, so it is the most common. Oxygen is the most common element by mass on Earth. It is the third most common element in the universe, after hydrogen and helium. About 0.9% of the Sun's mass is oxygen. Oxygen makes up 49.2% of the Earth's crust by mass as part of oxide compounds like silicon dioxide. It is also the main part of the Earth's oceans, making up 88.8% by mass. Oxygen gas is the second most common part of the atmosphere, making up 20.8% of its mass and 23.1% of its volume. Earth is strange compared to other known planets, as a large amount of its atmosphere is oxygen gas. Mars has 0.1% O2 by volume with the rest of the Solar System's planet's having less than that. The high amount of oxygen gas on Earth is because of the oxygen cycle. This is mainly controlled by photosynthesis, which makes oxygen gas from carbon dioxide, water and the Sun's energy. Respiration then takes the oxygen gas out of the atmosphere and turns it back into carbon dioxide and water. This happens at the same rate, so the amount of oxygen gas and carbon dioxide doesn't change because of it. O2 is a very important part of respiration. Because of this, it is used in medicine. It is used to increase the amount of oxygen in a persons blood so more respiration can take place. This can make them become healthy quicker if they are ill. 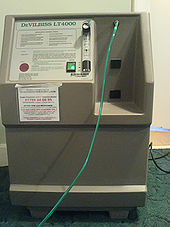 Oxygen therapy is used to treat emphysema, pneumonia, some heart problems, and any disease that makes it harder for a person to take in oxygen. Low-pressure O2 is used in space suits, surrounding the body with the gas. Pure oxygen is used but at a much lower pressure. If the pressure were higher, it would be poisonous. Oxygen's NFPA 704 (on the right) says that compressed oxygen gas is not dangerous to health and is not flammable. At high pressures, oxygen gas (O2) can be dangerous to animals, including humans. It can cause convulsions and other health problems. [a] Oxygen toxicity usually begins to occur at pressures more than 50 kilopascals (kPa), equal to about 50% oxygen in the air at standard pressure. Premature babies used to be placed in boxes with air with a high amount of O2. This was stopped when some babies went blind from the oxygen. Breathing pure O2 in space suits causes no damage because there is a lower pressure used. If liquid oxygen is spilled onto organic compounds, like wood, it can explode. ↑ 3.0 3.1 3.2 3.3 3.4 Cook & Lauer 1968, p.499. ↑ Chisholm, Hugh, ed. (1911). "Mayow, John" . Encyclopædia Britannica. 17 (Eleventh ed.). Cambridge University Press. pp. 938–939. ↑ World of Chemistry contributors (2005). "John Mayow". World of Chemistry. Thomson Gale. ISBN 978-0-669-32727-4. Retrieved December 16, 2007. ↑ Best, Nicholas W. (2015). "Lavoisier's 'Reflections on Phlogiston' I: Against Phlogiston Theory". Foundations of Chemistry 17 (2): 137–151. doi:10.1007/s10698-015-9220-5. ↑ Marples, Frater James A. "Michael Sendivogius, Rosicrucian, and Father Of Studies of Oxygen" (PDF). Societas Rosicruciana in Civitatibus Foederatis, Nebraska College. pp. 3–4. Retrieved 2018-05-25. ↑ Bugaj, Roman (1971). "Michał Sędziwój - Traktat o Kamieniu Filozoficznym" (in pl). Biblioteka Problemów 164: 83–84. ISSN 0137-5032. https://books.google.com/?id=d0gaAQAAMAAJ. ↑ 15.0 15.1 Parks, G. D.; Mellor, J. W. (1939). Mellor's Modern Inorganic Chemistry (6th ed.). London: Longmans, Green and Co.
↑ Daintith, John (1994). Biographical Encyclopedia of Scientists. CRC Press. p. 707. ISBN 978-0-7503-0287-6. ↑ Chieh, Chung. "Bond Lengths and Energies". University of Waterloo. Archived from the original on December 14, 2007. Retrieved December 16, 2007. ↑ Stwertka, Albert (1998). Guide to the Elements (Revised ed.). Oxford University Press. pp. 48–49. ISBN 978-0-19-508083-4. ↑ Cacace, Fulvio; de Petris, Giulia; Troiani, Anna (2001). "Experimental Detection of Tetraoxygen". Angewandte Chemie International Edition 40 (21): 4062–65. doi:10.1002/1521-3773(20011105)40:21<4062::AID-ANIE4062>3.0.CO;2-X. PMID 12404493. ↑ Ball, Phillip (September 16, 2001). "New form of oxygen found". Nature News. Retrieved January 9, 2008. ↑ "Liquid Oxygen Material Safety Data Sheet" (PDF). Matheson Tri Gas. Archived from the original (PDF) on February 27, 2008. Retrieved December 15, 2007. ↑ "Oxygen Nuclides / Isotopes". EnvironmentalChemistry.com. Retrieved December 17, 2007. ↑ Morgenthaler GW; Fester DA; Cooley CG (1994). "As assessment of habitat pressure, oxygen fraction, and EVA suit design for space operations". Acta Astronautica 32 (1): 39–49. doi:10.1016/0094-5765(94)90146-5. PMID 11541018. ↑ Webb JT; Olson RM; Krutz RW; Dixon G; Barnicott PT (1989). "Human tolerance to 100% oxygen at 9.5 psia during five daily simulated 8-hour EVA exposures". Aviat Space Environ Med 60 (5): 415–21. doi:10.4271/881071. PMID 2730484. ↑ Dharmeshkumar N Patel; Ashish Goel; SB Agarwal; Praveenkumar Garg et al. (2003). "Oxygen Toxicity". Indian Academy of Clinical Medicine 4 (3): 234. http://medind.nic.in/jac/t03/i3/jact03i3p234.pdf. ↑ 40.0 40.1 (1991) "ASTM Technical Professional training". Philadelphia: ASTM International Subcommittee G-4.05. This page was last changed on 21 March 2019, at 14:02.